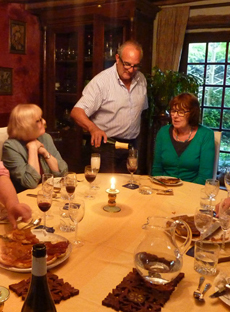 The cookery classes will be given by Michel Pigny, an ex-schools inspector and local gourmet chef. 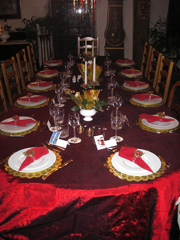 You will learn how to prepare a typical regional meal, with entrée, plat de résistance (viande ou poisson + legumes), salade, fromage et dessert. 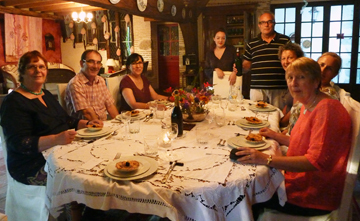 You will cook from around 3.30 to 6.30pm, and then learn how to lay a table à la française. 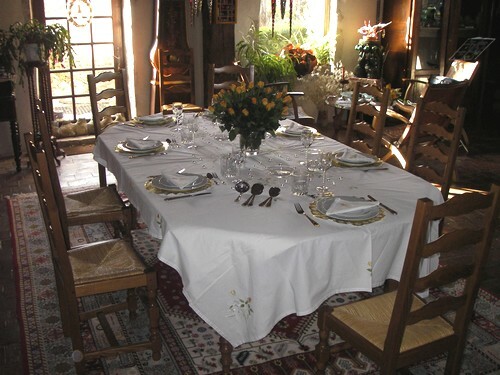 An aperitif will be followed by enjoying the food you have cooked around a communal dinner table, accompanied, of course, by wines of the region. Recipes will be printed out for you to take away. These classes will usually take place on Sundays or Mondays, though not on the 14 juillet week when an alternative afternoon will be found. The classes will of course be conducted exclusively in French. The additional cost will be 40 euros, payable in Suèvres, but please let us know if you would like to do the course before you come so that we can ensure we have sufficient fresh produce. Enjoying the fruits of their labours!